Regular readers will know that I’m excited about the emerging opportunities that 3D printing technologies are enabling. In fact I’ve been looking for an investment in this area for nearly two years now. My first thought was that falling costs and rising quality would unlock opportunities in the consumer space, but none of the opportunities we have looked at worked out, mostly because the use cases weren’t compelling enough or were too niche. Now that you have that background you will understand that when I saw the headline 3D printing ‘photo booths’ popping up across the world I clicked straight through. The article, which is on the excellent Singularity Hub, rightly notes that there has been a lot of talk about 3D printing this year, and that ‘tech experts are still looking for something that will signal the technology’s best bet to transition from hype to mainstream application’. I’m with them up to that point, but then they say ‘Today, one application seems poised to accomplish this. Call it 3D printed figurines, personal miniatures, or photo sculptures’. That is where I think they got it wrong. Here’s why. What do people do at the moment which suggests they will want the new product? What spend or activity will the new product displace? Strong answers to these questions suggests that there will be demand for the product. There are a host of other questions that follow, not least ‘can it be profitably sold at a sensible price point?’ but with good answers here you have got something to work with. I think 3D figurines are very cool, and I can see myself giving them as presents and maybe even buying one for myself, but when I apply these questions I come up blank. I can’t think of anything people do that suggest they really need 3D printed figurines and I can’t think of any spend that could be displaced. I would bet that when people are buying figurines the money is coming from their discretionary pot. There’s nothing wrong with that, but it doesn’t indicate to me that there is a sustainable market here. My guess is that at best we might see a fad where lots of us give these figurines as presents for a short while, but then the novelty will where off and we will be onto the next thing. I also don’t think the quality is great and hence the novelty value will be short lived. Instead of making a mold and sending it to a lab for scanning, dentists are now using a small camera to scan the misshapen teeth directly. The digitized scan is then sent to an on-site milling machine that carves the crown from a block of porcelain – in about an hour. After about 15 minutes of preparation the crown is ready to be implanted. …. Normally getting a crown, a restorative ceramic cap that is cemented atop a damaged tooth, begins with the dentist drilling into the damaged tooth for a good fit. 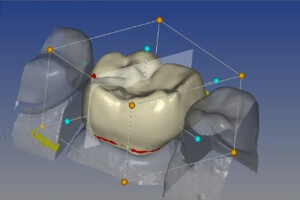 After drilling, a mold is made of the tooth, and the mold is sent to an outside lab where its 3D structure is scanned and digitized. That digitized image is then sent back to the dentist who makes modifications as needed, and once again it’s back to the lab where the crown is finally made. The entire process normally takes about two weeks. In the meantime, the dentist implants a temporary filling to protect the drilled tooth. The article doesn’t comment on whether the 3D printed crowns are cheaper than traditional alternatives, but with 3D printing costs halving each year if it isn’t now it soon will be. Then before long all dentists will be using a system like this and an entire mini-vertical will have been transformed. This isn’t the first, that was rapid proto-typing, which has been slowly adopting 3D printing over the last twenty years. The second vertical to go was hearing aids where I’ve heard up to 90% of high end hearing aids are now 3D printed. Patients ears are scanned and a high resolution 3D printer makes a hearing aid that fits them perfectly and has audio channels that work more effectively than is possible with traditional manufacturing. As the price of 3D printing falls and the resolution and ranges of materials increases other verticals will drop, starting with small sized objects like teeth and hearing aids. A company called Sirona sells the machines dentists use to 3D print crowns. That’s a $914m revenue business now and well past the stage of venture capital investment. I’m on the lookout for equivalent companies that are just beginning to disupt other markets. I’m in Leuven, Belgium for most of this week visiting 3D printing leader Materialise and attending their 3D printing conference. For most of you Materialise is a lead contender for the ‘most successful and innovative European company you’ve never heard of’. The business is 20 years old, has 1,000 employees in 15-20 countries, and most importantly works on a lot of amazing projects. Some of them are inspirational from a design perspective, others from a business growth perspective (particularly in the medical field), some for their sheer amazingness, and still others for their beneficial impact on the environment and other world issues. I’m here because it seems to me we are on the cusp of a massive increase in consumer use of these technologies, but the surprising thing for me at this conference so far has been the extent to which 3D printing has been adopted in other industries. Just about every company I talk to here is doubling sales each year. This market growth is backed up by a lot of great stories and numbers that I’ve been asked not to share, but I will say that some of it is truly incredible, particularly the inside story of the recent Belgian face transplant. It is also interesting to think about where this is going next. As the Materialise guys see it, at the moment 3D printing in volume is rarely cost effective for anything with a volume greater than a large marble or maybe a tennis ball. Improvements in technology and materials costs are driving costs down fast though and applications with slightly larger volumes are therefore good candidates for adoption of 3D printing in the near future. At the moment these technologies are being put to incredible uses, but they are too expensive for most large scale applications. That is changing fast though as advances are driving down prices and increasing quality. We first started to get interested in 3D printing a year or so back, and at that I played with a number of the services on the market, but the experience wasn’t easy, and 3D printers in the home still seemed some way off. Both those things are now changing fast. The usability challenge was that the modelling tools were difficult to use and the integration with 3D printing services was difficult. In just 20 minutes earlier today I modelled the design below on 3dtin and then exported it to i.materialise where I was able to send it off to be 3D printed. Hopefully it will arrive in a couple of days. 3dtin was incredibly easy to use, so much so that I could see my seven year old daughter modelling stuff as part of her schoolwork or to play with at home. The ‘so easy a child could use it’ also struck the folks at Origo, who are planning to make a 3D printer for children (prototype picture below). I want one of those. 3D officionados amongst you will have noted that Makerbot recently raised $10m to grow their home assembly 3D printer kit business, so we have affordable 3D printers in the home already, although their product is best for early adopters who are good with a screwdriver. I believe that 3D printing will be more revolutionary than 2D printing. The possibilities are almost limitless, and it now feels like the timing for the market is almost on us. A friend of mine (David Brown, founder of buy.at) recently bought a Makerbot and he emailed me saying he was coding for it in the dark with his headphones on, and that it felt like 1993 all over again. Regular readers will know I’m a believer in the web going 3D, well parts of it anyway. I blogged recently about Sun’s and IBM’s interest in the area, and then yesterday I got invited to an IBM conference on the subject in July. So I’ve been checking out a few things – and the space is definitely getting hotter. For the IBM conference you can either go in person or participate via Active Worlds – so I went in there to have a look and found myself having a right laugh with a guy from Australia. Compared to Second Life the world was incredibly easy to use – a real joy, I was flying around in no time and practicing my dancing and karate kicks. There.com is another virtual world I’ve been having a play around in that’s quite fun. Fotowoosh is a cool little service that takes 2D photos and makes them 3D. Different type of thing entirely but I wonder if something a bit like this could be used to good effect on ecommerce sites. Check out how it looks in these samples below. I can’t shake the feeling that somehow, somewhere, some really useful mainstream apps are going to come out of this stuff. I’m not sure what they will be, and I can’t put my finger on anything more than training and conferences yet.